Resilience is an important quality for champions. American Kayla Day and Canadian Felix Auger-Aliassime proved they had it Sunday, rebounding from prior disappointments to claim US Open junior titles at the USTA Billie Jean King National Tennis Center. Day's frustration was recent and raw. Late Saturday night, Day and her partner Caroline Dolehide had lost the girls doubles final to Ena Shibahara and Jada Hart, with Day double faulting on the first of their two match points. In her semifinal singles match earlier Saturday afternoon, the fifth-seeded Day had played a error-filled first set, calling herself a "mess" in the start of that match, her first on the new Grandstand. But when she returned to that court Sunday, a cooler and less humid day, the 16-year-old from Santa Barbara, California was ready for the occasion of her first junior slam final, beating No. 13 seed Viktoria Kuzmova of Slovakia 6-3, 6-2. "I think I was really able to mentally set aside what had happened last night and just move on, because I knew I had a really important match today," Day said. "I knew I had to forget about it and that's what I did. I'm pretty good about leaving the past behind me and just focusing on being in the moment." Day broke Kuzmova for a 3-1 first set lead then held to make it 4-1. Day had two break points for a 5-1 lead, but Kuzmova saved them both, and Day immediately went down 0-40 on her own serve. But an ace and two great first serves brought her back to deuce and two points later she had a 5-2 lead. "That was a huge game," Day said. "I got down love-40 and then I served some really good serves. I was getting a little bit nervous at that point, but after that game I felt really confident." "She hit like four amazing serves," said the 18-year-old Kuzmova, who had 23 aces in her three-set semifinal win over Sonya Kenin, but none in the final. "It was tough, but I can't do much. She played really well today, she didn't do many mistakes, was really good and she also served really well." Kuzmova, also playing in her first junior slam final, held for 5-3, and Day, starting the final game of the set with an ace, finished it with a forehand volley winner. Day opened the second set with a break in a four-deuce game, but Kuzmova had been down a set and an early break to Kenin on Saturday and come back. True to form, Kuzmova earned two break points in Day's next service game, but a great serve saved the first. The second break point resulted in a Kuzmova challenge, but her ball was confirmed to be just out on the baseline, and Day held for a 2-0 lead. Day crushed a forehand return winner to give herself three break points in the next game, and she got the insurance break with a fortunate let cord winner. Another easy hold made it 4-0 and Kuzmova, who had 30 unforced errors to Day's 14, couldn't find any consistency in the rallies. Serving for the match at 5-2, Day earned two match points when Kuzmova's forehand went long, but Day double faulted on her first match point. If she had any thoughts about her doubles match double fault on match point last night, they exited quickly, when her classic lefty serve out wide resulted in an ace. Day will assume the No. 1 ITF junior ranking on Monday with the title, but retaining it is not a particular priority. Although she has not had much time to consider the question, saying she was not aware she would be No. 1 with the title, Day is looking more at the benefits for her on the WTA tour. Day receives extra wild cards by the WTA, which are important because she doesn't turn 17 until later this month, meaning another full year of the WTA's age restrictions. "I know that there is some type of rule that if you finish with a certain ranking or if you get to the finals of a [junior] slam, you get more tournaments," Day said. "I think that would be the most beneficial thing for me, since I'm still quite young and I can't play a full pro schedule." 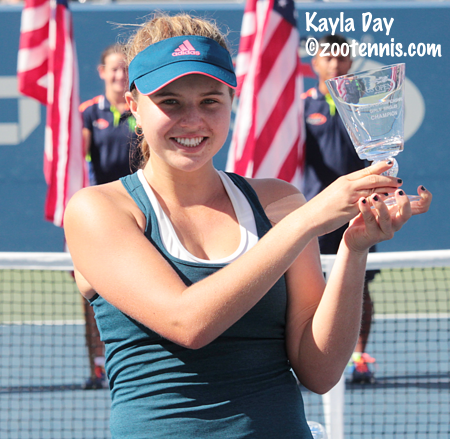 Day, who has not yet made her decision about turning pro, has collected not only the USTA 18s National Championship and the US Open Junior Championship since the beginning of August, but has also posted three WTA Top 100 wins in the past month, including one in the US Open main draw. Right now she is aiming for her first ITF Women's Circuit title with an eye toward the Australian Open women's qualifying in January. "I think I'm going to play a lot of pro circuit tournaments in the U.S.," said Day, who is coached by the USTA's Henner Nehles. "I haven't decided if I'm going to play the junior tournaments at the end of the year, but definitely a lot of pro circuits to build up my ranking and to be able to make the Grand Slam qualies next year." But after nearly three weeks in New York, Day, who is the first US girl to claim a junior slam singles title since Samantha Crawford won the US Open in 2012, is looking forward to enjoying her title. "These were the best two weeks of my life. Every day was great," said Day, who has yet to decide how she will celebrate. "I had so much fun every single day, and it was just a great experience overall." Unlike Day's, Auger-Aliassime's disappointing loss extends back much farther than the previous night. The Canadian, 15 years old at the time, had three match points in the final of this year's Roland Garros boys championship match, but ended up losing it to Geoffrey Blancaneax of France 1-6, 6-3, 8-6. In Sunday afternoon's final against No. 5 seed Miomir Kecmanovic of Serbia, Auger-Aliassime put all that behind him, needing less than an hour to come up with a comprehensive 6-3, 6-0 victory. "Obviously I'm not gonna lie," Auger-Aliassime, now 16, said of that French Open final. "I had some nightmares about this heartbreaking final. You don't really want it to happen again. So I was really focused going into this match. I really wanted that win. Yeah, it's obviously a great feeling." Auger-Aliassime was challenged by the 17-year-old Serbian only once, with Auger-Aliassime serving at 4-2 in the opening set. Down 15-40, Auger-Aliassime saved the only break points he faced in the match, with his serve coming through for him. But even if he had lost that game, Auger-Aliassime was confident he would eventually claim the win. "Yeah, I think there was a pretty good, pretty big game to go get," said Auger-Aliassime, the No. 6 seed. "After, you never know what's gonna happen. Maybe he gets back in the match and he gets more pumped. Anyway, I would have been on the next game, would have been mentally prepared, so I didn't put too much importance on that game. Because you didn't want to get nervous at 4-2 in the first set because you're down a break point. Yeah, it was great to fight and get that game." Kecmanovic didn't have a good serving day, making only 47 percent of his first serves, while Auger-Aliassime made 63 percent of his. "The guy just played too good today," said Kecmanovic, who trains at the IMG Academy in Bradenton, Florida. "He was not missing a lot of balls, making almost every first serve, all of his shots were going very deep in the court, so it was very tough out there to play." The second set, which took only 18 minutes, was all Auger-Aliassime, who was determined not to let his opponent back into the match, as he had done at Roland Garros after a dominating first set. "I think it was one of the best performance I have had," said Auger-Aliassime, who is coached by Tennis Canada's Guillaume Marx. "And also in the final you never know what can happen. You know, you don't always play your best level because you're a bit nervous and there is something big to go get." "But, yeah, I just stayed really steady," Auger-Aliassime continued. "My serve, first-serve percentage, was really high today. I had a few aces, so of course it helps. And in the second set I think I was really going through him and putting a lot of pressure on him." After converting his match point, Auger-Aliassime fell on his back in celebration, but quickly scrambled back to his feet to shake Kecmanovic's hand. In a year in which he made a junior slam final and won a title, Auger-Aliassime is ready to think about pro tennis, hoping to follow in the footsteps of last year's boys champion Taylor Fritz. 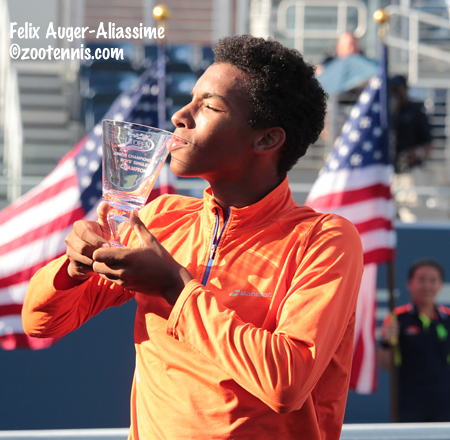 "It might," Auger-Aliassime answered when asked if the title would change anything for him. "Because I have already had some good wins at the pro level. I know I can compete with these guys. And now being able to win a slam, make a final on two different surfaces, I think it might be time to go to the next level. But you never know what's gonna happen next year. If I want to go back and play the junior Grand Slams, I will. A guy like Taylor won the US Open last year and was top 100 the year after. Everyone is kind of different. We'll see how my body feels after this year. We'll make the adjustments that we need to do, we'll see how it goes." Auger-Aliassime values the experience of playing the junior slams, with this US Open his fifth, and the only one he's played twice. "I think the junior level is really great to play the Grand Slams. You know, you kind of get the feeling of the environment and you see the big guys next to you and you have the chance to see these unbelievable tournaments," Auger-Aliassime said when asked about the possibility of finishing the year as the World Junior champion. "But after all, it's really in the pro circuit that is really important. Obviously I would want to be No. 1 in the world. It would be a big bonus, but that's not what we are aiming for here." The boys singles draw is here. The girls singles draw is here. Now that the tournament is over, any final thoughts on the shot clock experiment? From watching on TV it seemed the players never took the clock into consideration. Was it a non-factor because juniors play relatively faster than the pros, or did they simply just get on with it knowing that there was a time limit, or was it simply an experiment for data collection rather than enforcement? I am planning a extensive review of it, with many comments from players, but not right now. In general I believe it was an experiment worth doing.